Inspired by last week's scintillating post, you are no doubt champing at the bit to start your own printed leaf collection. But Cokie, you say, what do I look for? How do dealers determine what book the leaf came from? How can I verify what they say is true? Guide me!! Never fear, little ones, I'm here for you. A GREAT place to start educating yourself about incunabula is on the National Diet Library of Japan's website Dawn of Western Printing. 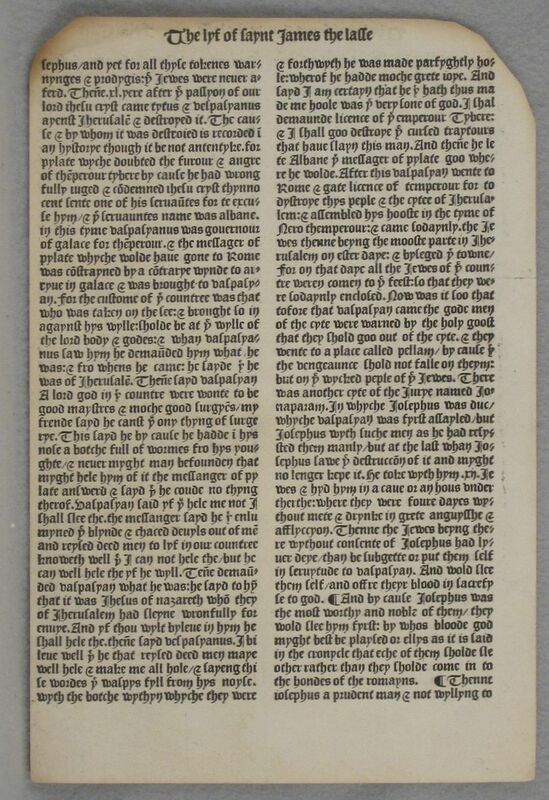 It is by far the most clear and comprehensive description of early printing in the West that I have found online. 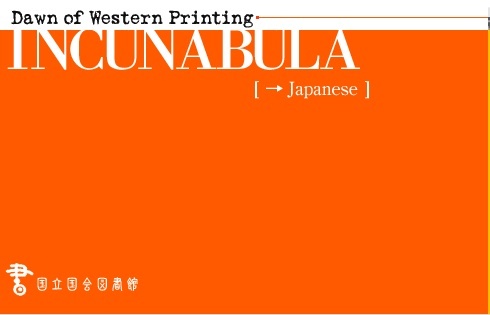 It covers the invention of movable type in the west, the mechanics of early printing presses, the major printers of the day, the identification of typefaces, the design and making of books, and bookbinding. It also provides a chronology, a glossary, and examples of typefaces. Yes, it's in German. And it's not a great image. But bear with me. Even if you, like me, do not read German, this record still contains valuable information you can use. The first line gives the GW reference number (04222), the title, imprint information, and size. In the second line, "470 Bl" refers to the number of leaves in the book. The string of letters following that refers to the signatures of the leaves. Next is the information that you can link to the leaf description provided above. "2 Sp. 52 Z" corresponds to "Double column, 52 lines of text." When I catalogue leaves, I spend hours counting lines of text and comparing the total to the bibliographic reference books. Yes, it's just as thrilling as it sounds, but it's also necessary if we are to establish the provenance of our leaf. Another important reference tool is the British Museum Catalogue of XVth Century Books, refenced in the description above as "BMC V, 176" (page 176 in volume five of the work). This was compiled by some of the most OCD librarians in history, which is saying something. 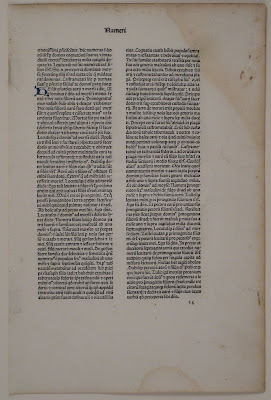 It is an excruciatingly detailed description of the incunabula held by the British Museum, and is divided by region, with Germany and Italy taking up eight of its 13 volumes. Printers are arranged by city, and then alphabetically. 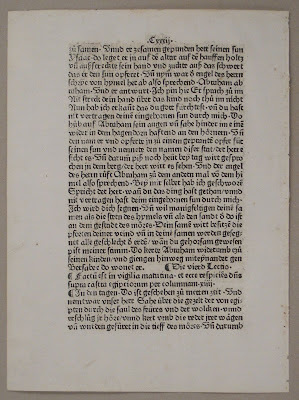 A brief introduction tells you what is known of the printer, and then lists his works by date of publication. In addition to author, title, imprint, and size, BMC also gives us the measurements of the text block, the arrangement of the page (i.e, single column, double column, text surrounded by commentary), the typeface and its size, and the number of lines per page. 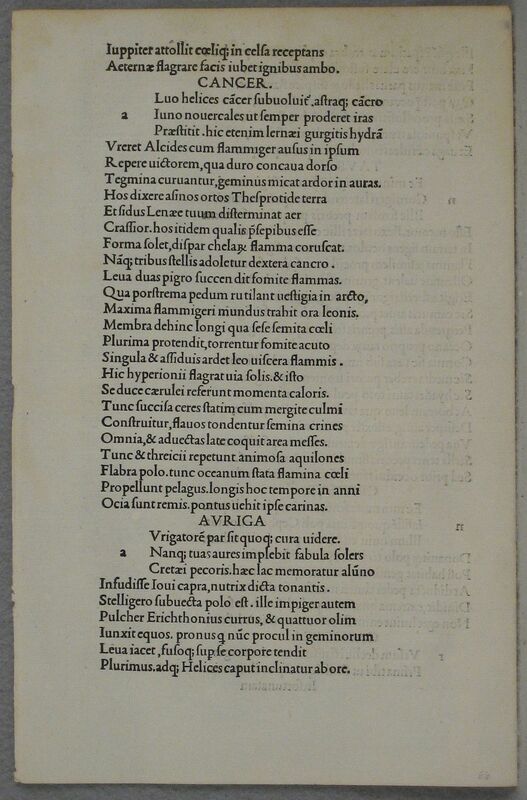 Two companion volumes contain facsimiles of hundreds of typefaces used by early priters, which the researcher can check against the typeface on their leaf to verify its publisher. Dawn of Western Printing has a section that demonstrates this and allows you to test your text ID skills. The last part of the dealer's description above lists gives you the "faults", telling you about any imperfections. Leaves from books over 500 years old are rarely flawless, but many are in better condition than you would expect. The handmade paper used in the 15th century has stood the test of time far better than the mass-produced papers of the 19th century. 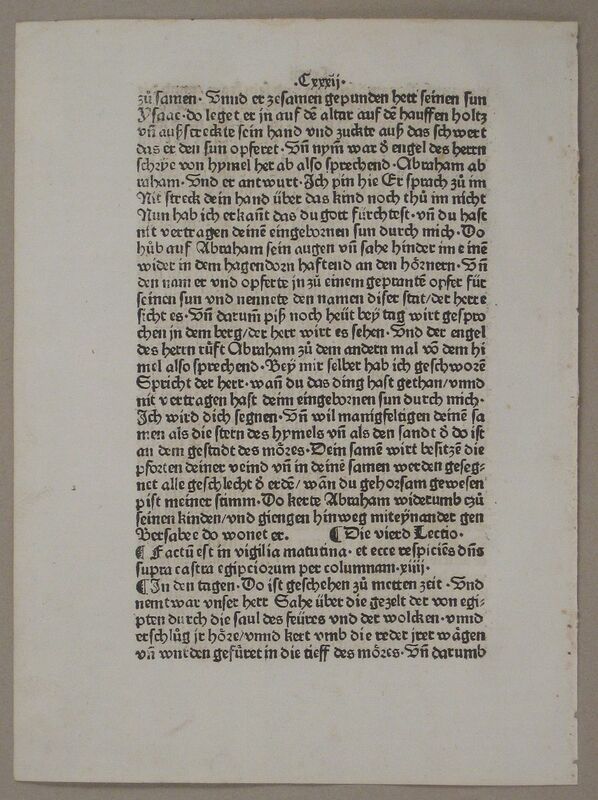 The price of a printed leaf is determined by the condition it's in, the importance of the book it came from and the printer who printed it, and its content. Because bibles and other religious books were more common, leaves from books with secular content are especially prized. Below are examples of leaves priced from $45 to $450. Why is the last leaf so much more expensive than the others? First and foremost, because it's in English. 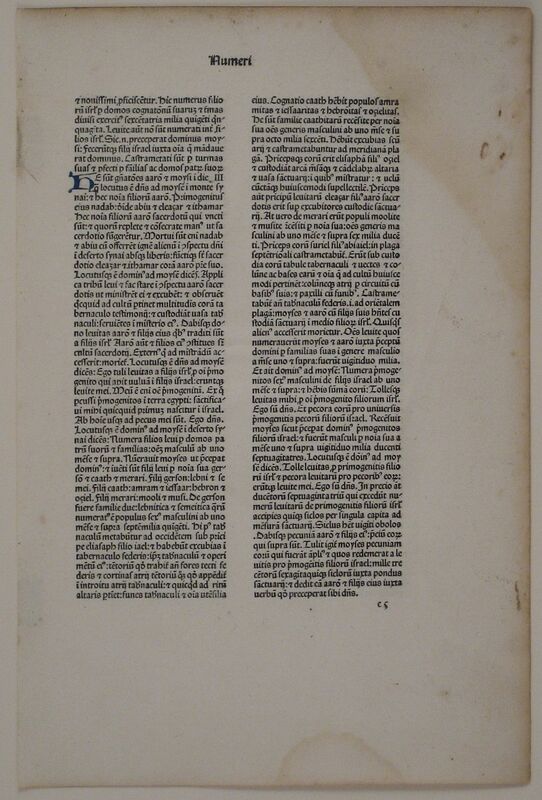 It's also printed by Wynkyn de Worde, successor to the first great English printer, William Caxton. The "STC" citation you see there refers to the Short Title Catalogue, a listing of early English books compiled by the British Library. The online version is available here. 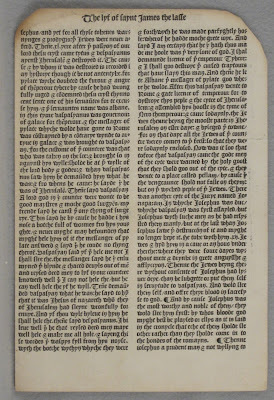 You can find early printed leaves from ABAA booksellers, at antiquarian books fairs, and by searching sites like viaLibri for "printed leaf" in the keywords or title field. A dealer's description should tell you the author, title, printer and place of publication, date, size, and the number of lines of text, and a bibliographic citation, along with any faults. I've crammed a lot of esoteric information in this post, and I fear it may be a bit confusing. If you have questions or need clarification on any point, please feel free to post them in the comments. Otherwise, happy leaf raking! 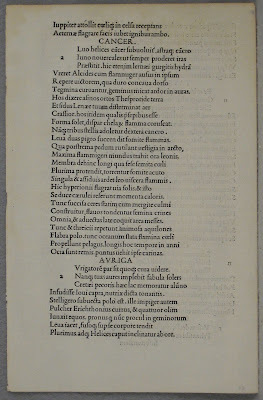 Images of printed leaves courtesy of Phillip J. Pirages Fine Books & Manuscripts.